Pencils Down, Pass the Remote: The Nielsen system obviously isn't working, but can it be fixed? The Nielsen system obviously isn't working, but can it be fixed? 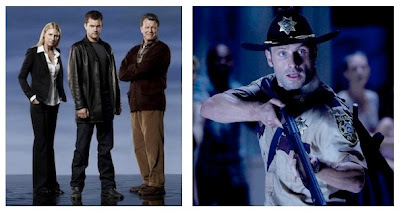 Fringe is generally considered a ratings failure for FOX, despite garnering the same number of viewers as The Walking Dead, which was considered a smash hit for cable network AMC. Photos courtesy of tvfanatic.com and eonline.com. The Huffington Post recently published an article decrying the current Nielsen rating system. "TV Ratings: Are We Looking At Them All Wrong?" is an interesting read that nicely details the problems with the Nielsen rating system and ways in which it may or may not be evolving to suit the needs of the digital age. It's also, however, a painfully obvious rehash of things that bloggers, critics and creators have been pointing out for years. Yes, the Nielsen rating system is obviously becoming obsolete in an era where many viewers watch TV on their laptops and cell phones, and yes, network executives and advertisers need to completely rethink the way in which they look at a given series' popularity. Anyone who knows anything about television knows that. The problem is that reworking the system to suit an increasingly digital, fragmented landscape is going to be massively complicated and full of holes. One of the major problems with the current ratings system - as any critic will tell you - is the way in which the Nielsen rating of a given show has become the major indicator of whether or not that show will get picked up for another season. The way the Nielsen ratings of a given show are constantly hyped, distributed and analyzed by critics and viewers alike has led to a perception that a show's Nielsen number is the be-all and end-all of that show's future. As an ardent Fringe fan, I experienced this first-hand over the last year. Every Friday morning (Saturday morning after the show was moved) I would check the previous night's ratings, desperate to know whether they had fallen or risen, hoping that my show would be saved even as I watched the numbers slowly decline. But then something wonderful happened: the show was renewed! Fringe will be coming back for a fourth season after a fantastic, action-packed, emotional, shocking finale that was seen by less than 4 million viewers. And I have to attribute this to the FOX network executives - who I don't want to let off the hook completely, as they often make some head-scratchingly bad decisions - understanding a new reality of television: that maybe having a niche show with four or five million devoted, engaged viewers is just as good as having a monster hit. The thing is, there aren't a lot of monster hits anymore. Any network exec aiming for a new Seinfeld or M*A*S*H or even a Lost is going to be disappointed, because that's not the way the market works anymore. Cable programming has turned TV into a niche viewing experience where people can choose from hundreds of options rather than three or four. This has resulted in an increasingly fragmented - and, in my view, increasingly diverse and high-quality - viewing experience. The explosion of well-made, artistically important television in the last ten years has been unprecedented. The upside is that there is more choice than ever out there for viewers, and more high-quality programming than ever before. The downside is that the sheer number of options drives down the numbers for any single program, and the current rating system has no way to account for that. As choices increase, the very idea of a "major" network is becoming obsolete. Many of the most buzzed-about shows on the major networks - ABC, NBC, CBS and FOX - are drawing in audiences comparable to those of cable series. In particular, shows whose demographics skew younger, such as Community, 30 Rock, Fringe and Parks and Recreation have low Nielsen numbers. These shows also happen to be the ones that advertisers covet, as they draw in the all-important 18-34 demographic. These shows draw lower ratings for a number of reasons, but one that proves a major problem for the current system is the fact that this demographic is more likely to watch TV on their laptops or phones, as opposed to their TVs. As a 22-year-old student who doesn't own a television, I can tell you that most of my viewing happens on Hulu.com. Unfortunately for the shows I love, online numbers are only taken into account several days after an episode has aired; the number that gets publicized the morning after is the number of people who belong to Nielsen families and who watch the shows on TV. The fact that Nielsen boxes generally go to families also skews the ratings, because anyone who has ever watched TV with their parents can tell you that it often isn't their first choice of programming. The obvious way to fix this problem would be to count Internet viewers right along with TV viewers. Watching TV on the internet, however, is an entirely different beast than watching it live, and it one that advertisers don't like as much. One of the great benefits of Hulu is the fact that, rather than having to watch twenty minutes of commercials interspersed with your show, you only have to see four or five thirty-second ads. The problem here is that advertisers want you to watch their ads on TV, all twenty minutes of them, rather than just seeing a few per episode online. And yes, the ads online can theoretically be more targeted than ads on TV, which is good for advertisers, but tell that to the damn Geico ads that plague my viewing experience despite the fact that I don't own a car. Another problem with asking people to subscribe to a streaming video service is that there are plenty of ways to watch TV online for free. They may not be strictly legal, and they may not always be the best quality, but they give those of us without TVs an opportunity to watch not only major network shows, but basic cable and premium channel shows as well. As long as those alternatives are out there, a sizable percentage of the young population (most of my friends included) is not going to pay to watch TV. Particularly if the cable companies keep jacking up their prices - cable costs rise on average 5% a year in the US, and they're not going to stop any time soon. The point I'm trying to make in this incredibly roundabout way is that there is no way to really fix the Nielsen ratings so that they account for all the people who watch any given show. I haven't even gotten to the people who watch past TV seasons on DVD, or who buy the episodes from iTunes or Amazon. There is some talk of using a vague metric of "engagement" - according to the HuffPost article, Nielsen is also tracking "online discussions, Twitter feeds, Facebook shares and all the other ways that TV fans are interacting with their favorite shows online" - but this concept is nebulous at best and, given the TV shows that are most covered online, would probably lead you to believe that True Blood and Mad Men are the most popular shows on television. The real trick to figuring out a show's popularity in the digital age is going to be combining the traditional viewer count with online numbers and popularity metrics like discussion boards and Facebook and trying to plug the holes as they come up. It's not an easy task, but it could help little shows like Fringe survive as long as they deserve.